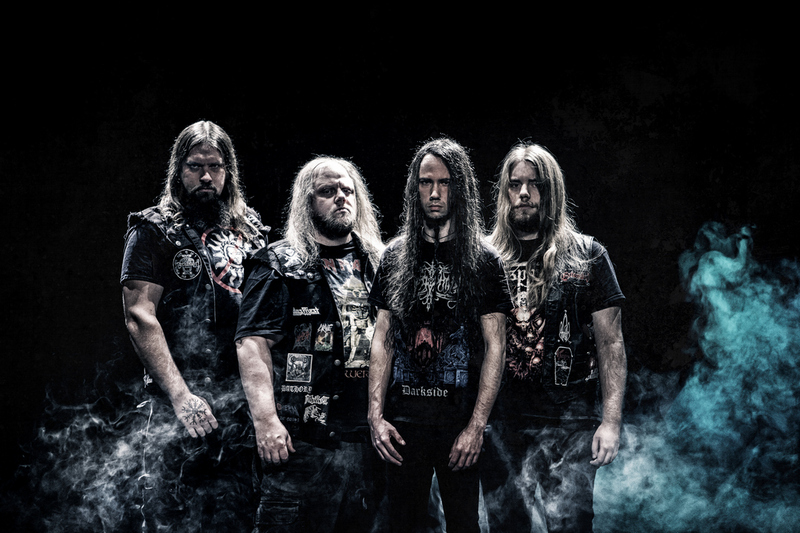 World Inferno is the latest album from the Swedish death metal band Entrails. We caught up with guitarist/band founder Jimmy Lundqvist, who fills us in on some lineup changes, the new record, tour plans and other subjects. Chad Bowar: You’ve had a couple lineup changes since the last album. How did vocalist/bassist Tommy Carlsson and drummer Martin Michaelsson come to join the band? Jimmy Lundqvist: It was a decision I made when I wanted the band to be more active and do more shows than before. Those who left had their other bands also, and they couldn’t do it all. So we made the decision to split in a good manner and no hard feelings. Did the lineup changes affect the songwriting process for World Inferno? The only thing is the lyric writing from Tommy, who did a hell of a job creating cool lyrics. Martin had his own ideas with the drumming, but he quickly did the drumming after my demos and instructions. They didn’t want to make a lot of changes on their first album. What are the pros and cons of recording the album yourself? I can only see the good things about recording it ourselves. We have full control of what’s being done and can’t complain afterwards to anyone other than ourselves. And that hasn’t been done so far. What’s the impact of someone like Dan Swano mixing and mastering the record? He is one of the best in the genre. He was around for sure when the golden years were sculpted in Sweden. And he knows exactly what we want as he has been doing our mixes since our first album in 2010. Easy to work with, and he always gives useful tips in the process like setup before recording, etc. How has the band’s sound evolved from Obliteration? We’ve tried to turn back the clock a few years and get the sound we had on our second album, with a wall of sound that became so famous among the fans out there. Obliteration had a more analogue feeling with less tweaked sound everywhere, compared to this new one which has a more aggressive sound. I always have a good feeling about what I do and with the band, so my expectations are good, and so far some reviews have been top notch. So that feels good, and it shows that we aren’t done as a band yet. Of course there are some who still want to be rude and insult us as a band, calling us a clone of Entombed; but I try to not listen to such morons. They just don’t get it yet, unfortunately. Our new booker is looking to get us some shows, and requests are coming in to be sorted out and perhaps confirmed. And then we work from that. We knew that festivals this year would be hard to get (since we signed the booker a bit late when all festivals were full already), so autumn and winter are our goal to have something done. What has been your most memorable Entrails live show? Hellfest 2016, no doubt. Biggest one, and such a damn cool experience. Got the interest when I was 12 when I got my first guitar that Christmas. But how exactly I started in music, I don’t remember. My first hero was a legend living here called Eddie Meduza. He played rock´n roll but with some nasty lyrics as his trademark. Then I had a friend who taught me to play some Metallica riffs from Kill em All and some Slayer, and at that time, I listened to ’80s metal from all kinds of bands. I taught myself their songs by listening to it. I also improvised a lot, and from that, I learned how to make my own stuff. What was the first metal concert you attended as a fan? I think it was an Alice Cooper show, or it could have been a Judas Priest show also. It was such a long time ago. My older brother took me to concerts several times. With the success of the band since you reformed it, do you regret not pursuing things harder back in the ’90s? Well yeah, sure, but I couldn’t. I had no musicians around me willing to pursue that dream. So I made tons of my own songs, just waiting for the moment that never came; so I quit and restarted in 2008 again instead. Are you able to make a living with music, or do you also have a day job? I have a day job. This music doesn’t make me enough cash to make a living. Only some savings for future investments. It’s mixed music. All kinds of ’80s and ’90s stuff. My player is very active at work, and then I prefer a bit of silence at home. We have our very own merchandise for sale and it can be found here; plus our fan club at Facebook as well. The website is about to be finished also in the near future. Supporting and purchasing the merchandise to be a true fan is something that never gets said enough!